The four most important Chinese mythical animals (四靈 si ling) for a good omen are: the Dragon (龍 long), the Phoenix (鳳凰 fenghuang), the Tortoise (龜 gui) and the Unicorn (麒麟 qilin). The Unicorn (pinyin: Qilin, Catonese: Kay-Lun, Hakka: Kie Lin) is a fabulous creature of good omen and the symbol of longevity, grandeur, illustrious offspring and wise administration. It is also said to bring "Rui (瑞 )" serenity and prosperity. Interestingly, in the Chinese hierarchy of mythological animals, the Qilin is ranked as the second-most powerful creature after the dragon. For the Hakka Chinese (客家) the Unicorn is the most important animal. The Chinese Unicorn is some times called Dragon Horse (龍馬). 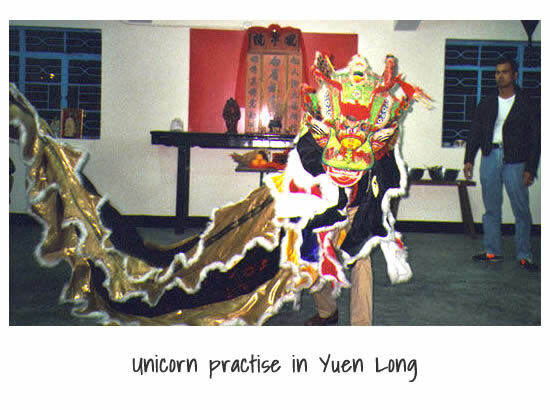 A kungfu school with a Hakka tradition is easy to recognize through the practice of the Unicorn dance. 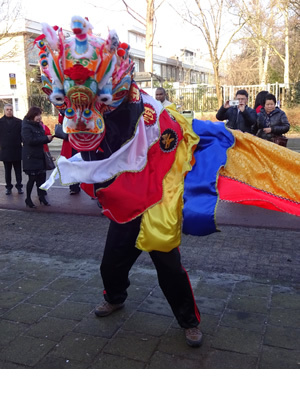 At the Jie Kon Sieuw Student Association (余官秀同學會) lessons are given from the Hakka tradition in Unicorn dance. 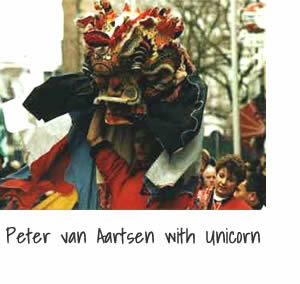 The looks of the mythical Chinese Unicorn are most similar to the western one. 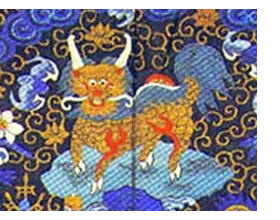 There are variations in the appearance of the Qilin, even as seen in a single country such as China owing to cultural differences between dynasties. 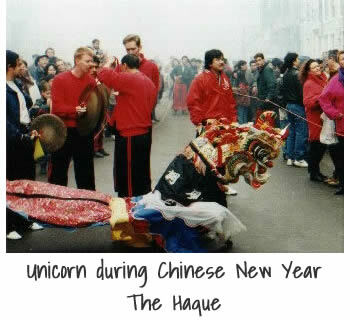 The Chinese Unicorn has the body of a deer, the tail of an ox, the forehead of a wolf and the sharp hooves of a horse. It's short horn, which grows out of it's forehead, is made of flesh; it's coat, on it's back, is of five mixed colors (red, yellow, blue, white and black), while it's belly is brown or yellow. It's voice is like the sound of bells and other musical instruments. The male has a horn, but the female is without this horn. The male is called "Qi (舞)" and the female "Lin(麒)". It is said that the Chinese Unicorn walks very gentle and is so careful it will not tread on the tiniest living creatures and will not eat grass that lies but only what is dead. To wound the Chinese Unicorn or to come across it's dead body is very unlucky. The span of this animal's natural life is a thousand years. It is universally known that the Unicorn is a supernatural being and of auspicious omen; so say the odes, the annals and other texts whose authority is unimpeachable. But this animal does not figure among the barnyard animals, it is not always easy to come across, it does not lend itself to zoological classification. The Unicorn used to be the symbol of the most highest military rank in the Qing army. The Unicorn that is being played has no optical resemblance to known one. 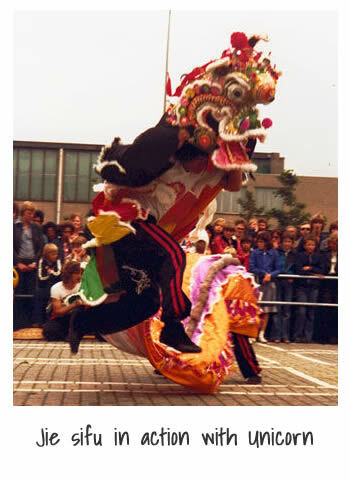 It's moves and looks are quite different than the well known Chinese Lion (舞獅). At the performance of the lion dance the players are high on their legs and the movements of the lion's head are in a shaking motion, mostly up and down worth. When performing the Unicorn dance the players are using very low and very high stances. The head of the Unicorn is moved in circular movements from the left to right and so now and then it's looking backwards. Is the Unicorn in a more restful mode, then the head is moved in little shaking movements like a lizard. To play the unicorn the student must have a very good condition, because the movements are very heavy and demanding for the arms, back and legs. The movements of the Unicorn differ from region to region from village to village. Like the lion, the body of a Unicorn consists of a head and tail. The head is usually much smaller than the head of a lion and therefore more suited for the fast movements. The classical Unicorn has a tail of about 4 meters. The competition Unicorn is much shorter and is measured about 2 meters. The music that is played during the play of the Unicorn consist of a gong, which almost has a hypnotic rhythm, large cymbals of approximately 40 cm and usually a flute and a little drum. 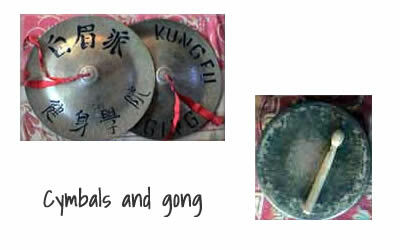 The sound of the drum is hardly noticeable and not as important as with the lion dance. 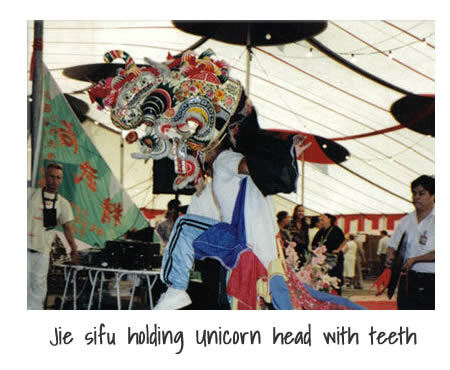 The play of the Unicorn can be ceremonial or can be very comic when the unicorn head is fooled by his own tail. 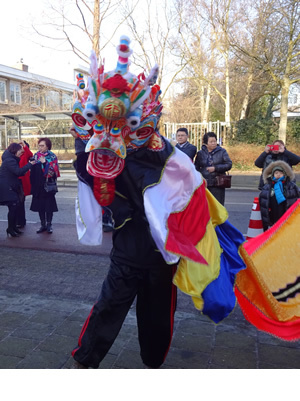 Every year during the celebrations of the Chinese New Year (過年) the Unicorn comes into action, especially to bring the Kejia restaurants and shops good fortune for the next year by paying then a visit. Just like the lion the Unicorn eats lettuce/green. This is hung up high close to a door. Does he succeed in getting the green loose and eating it, that means good fortune! The higher the green is hanging, the better is good luck (if the Unicorn succeeds in getting is loose). But also at weddings and the first year party of children the Unicorn is often found.